We currently have 2 vacancies at our warehouse in the village of Hose, Near Melton Mowbray, Leicestershire. If you want to know more, call Andrew Berry on 0116 276 6341. CV's must be received by 28th February 2017. The Kingsland Haco 150 ton x 3600mm CNC press brake manufactured in 2003 is looking great and comes complete with front and rear infrared safety light guards. It’s CE marked and features manual crowning, 3150mm between frames, 380mm daylight, throat depth of 50mm and a stroke length of 200mm. Our Colchester Magnum LB 800 is a fine piece of machinery offering 3048mm distance between centres and a swing over bed of 762mm. Specifications include 381mm height of centres and 508mm swing over cross slide. 1041mm swing in gap, 165mm spindle bore, no. 6 Morse Taper add to the list along with 2 fixed steadies and power saddle traverse. Our Hugh Smith 400 ton x 72" vertical bending rolls located at Hose has a capacity of 60" / 1524mm wide and 2" / 51mm thick. With many uses ranging from bending plate for cylinders, the production of pressure vessels, boilers, nuclear plant and legs/piles for oil platforms and modules to name a few. Supporting a maximum plate width of 72" / 1829mm and a beam stroke of 9" / 229m the Hugh Smith is an imposing machine standing and impressive 3.5m high. We have 11 horizontal borers in stock, from 5 trusted marques with 5 different spindle sizes, various tables and subtables, digital readouts and tailstock's. With 5 of them having video's, the only decision will be which one to see under power! Manufacturers include Kearns Richards, TOS, Union, Juaristi and Giddings Lewis & Fraser. Above is one of our Kearns Richards SH75's that's at our Leicester warehouse. The 125mm spindle Union BFT 125/5 has a video showing it under power (click the picture above to watch the video). With 35 horizontal bandsaws currently in stock, we're bound to have one that'd be just right for you. Semi or fully automatic, traditional or numerically controlled (NC), mounted on a swivel base or static and with capacities ranging from 229mm - 1100mm the choices are endless (well, nearly). We have 16 manufacturers in stock with multiple sizes just in case you're brand specific. These include: Amada, Behringer, Birket Cutmaster, Bomar, Cosen, Danobat, Do-All, Everising, Forte, Imet, Kasto, Mega, Sabi, Startrite and Zenith. Unused and used bandsaws give you the choice of age which is also reflected in the price, so whatever your budget we're sure to have the one for you. If you’re old enough to remember 1996, what did it mean to you? There was a royal divorce, a cloned sheep named Dolly, the DVD became widely available and Mad Cow Disease hit Britain. 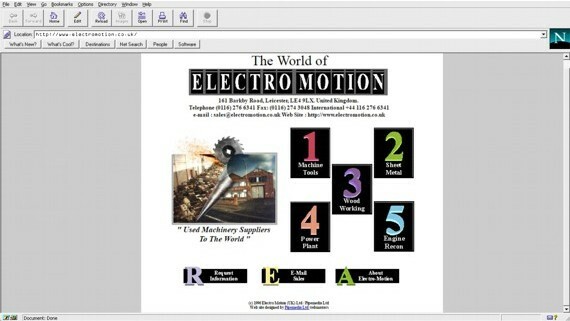 But for Electro Motion, it was the year that we launched our first website and we’re proud to say that in 1996 we were one of only 257,601 websites WORLD WIDE whereas there’s over 1 billion websites today (source internetlivestats.com). It was a bold step back then and one that made the world a much smaller place. Making that investment helped bring ourselves, and the second hand machinery industry bang up to date and shaped the way we would do business today. Above is a visual of how the original website looked back in 1996 using "the" leading Netscape Navigator browser and by contrast, our new website launched early 2016. We've come a long way since we started in 1948 and we like to think we're one of the best around but like all used machinery suppliers (and all suppliers for that matter) we're all trying to tell you that we're better than the rest, offer the best prices, the best service but until you take the plunge you'll never know. So, call us now on 0116 276 6341 and let us help you make the right choice for you. Toy Story, originally released in 1995 but came to the UK in 1996.."to infinity and beyond"
Webster and Bennett Vertical Borers (or Vertical Turning Lathes or a VTL)! Whether you call it a vertical borer, a vertical turning lathe or even a vertical boring & turning machine, our Webster & Bennett 72" (1829mm) CNC borer features a retro fit GE Fanuc series 18i-T control, 6 station turret and 4 jaw chuck along with a fixed rail. On the machines page on our website, there’s full specifications available to download as a PDF and also a video showing the machine in operation prior to moving to our premises. This is just one of 22 Webster & Bennett vertical borers (VTL or vertical turning lathes) for sale. Table sizes range from 36", 48", 54", 65", 72” and 77” including CNC or conventional, single, double column, with or without elevating rails and all from the UK's largest used machinery supplier. If you'd like information on this or any of our great value used machinery please call +44 (0) 116 276 6341 or send an email and we’ll be in touch as soon as we can. A comprehensive range of industrial machinery. 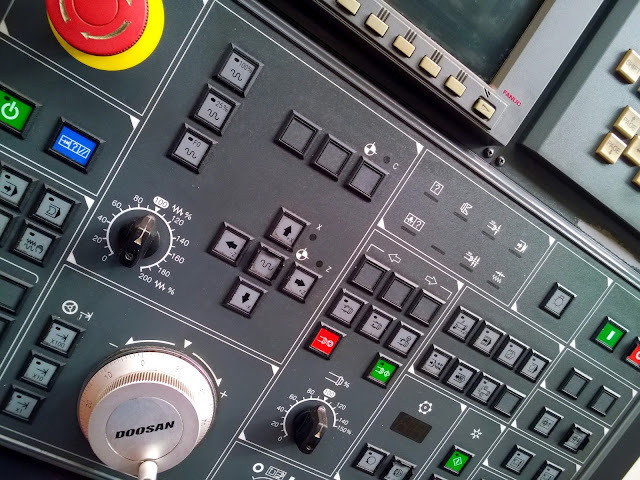 With over 250 machine tools, sheet metal and fabrication machines in stock, we’re confident that you’ll find that press brake to go with that guillotine or the ideal borer for your business. A new look, what do you think? Why Choose a Used Machine? A used machine is more cost effective than the equivalent quality new machine. There’s no waiting for a machine to be built. Some of the machines are not manufactured any more (at least not of the same quality as some of the machines we stock). We can usually supply your chosen machine within a few days, so if you’re based in Great Britain, you don’t have to wait for a shipment from the other side of the world.